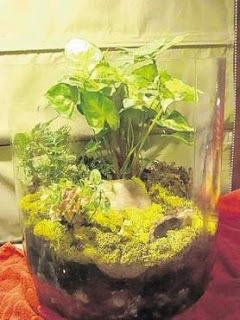 A terrarium with heft, spotted at an advertisement for a terrarium-making class in the Hudson Valley area. It would take attentive watering to keep the moss in this open terrarium happy. A good solution might be to partially cover the top with a sheet of plexiglass to help contain moisture.